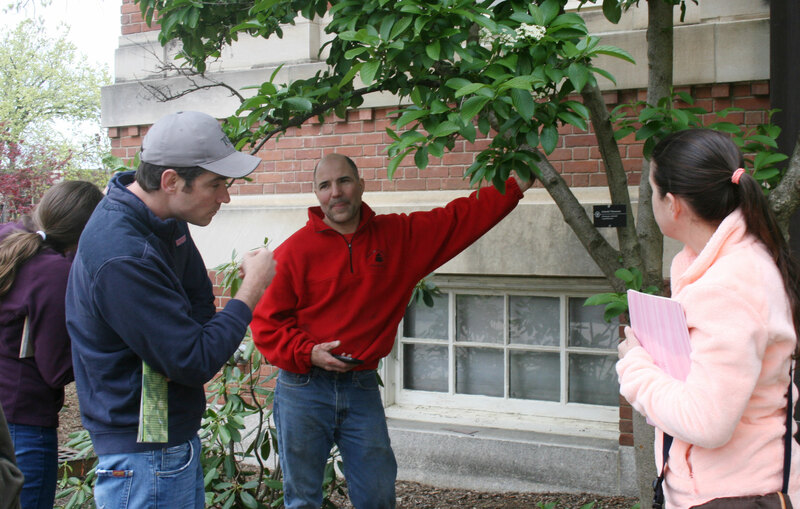 In mid-May, Professor Amanda Bayer, who specializes in plant materials at the University of Massachusetts Amherst, led a campus tour of ornamental trees and shrubs. The two-hour tour left attendees surprised and amazed at the botanical treasures and landscape beauty the campus offers. 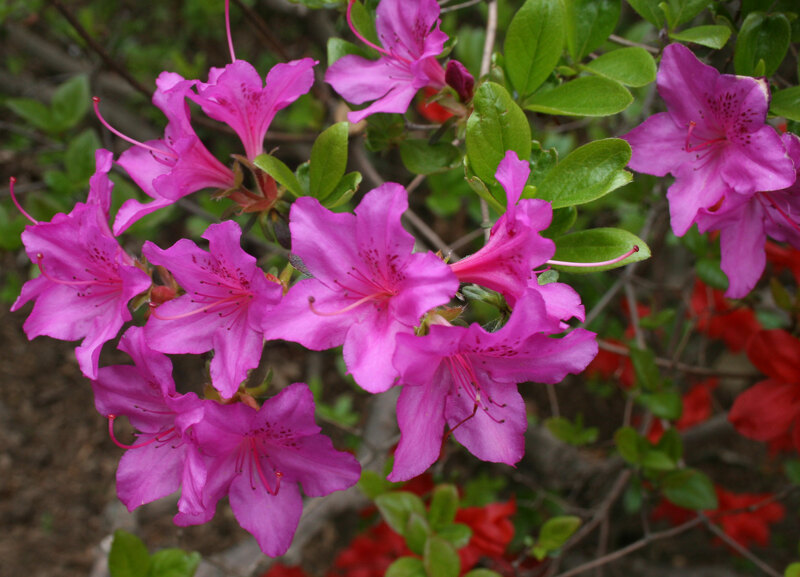 The crowd included several commercial landscapers seeking new options for clients, professionals earning continuing education credits, and a few people simply curious about the extensive Frank Waugh Arboretum. 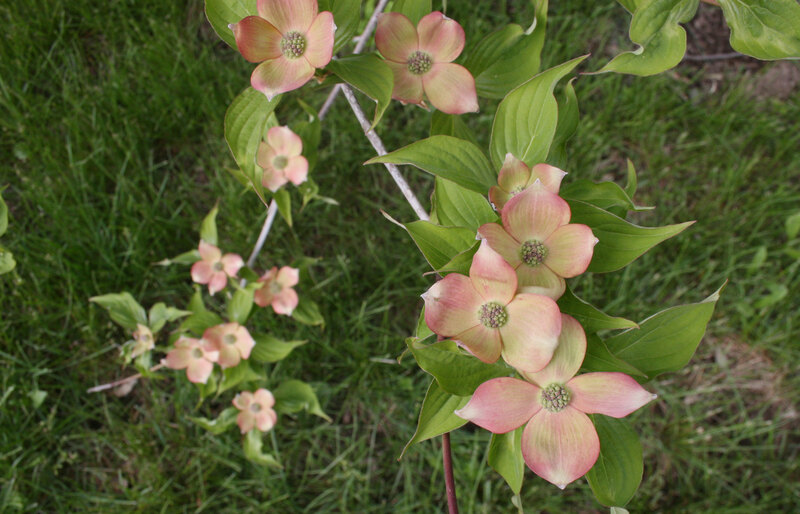 The managed portion of the campus’ land, 500 acres of the 1,400 acre UMass flagship, has been thoughtfully planted with trees, shrubs and flowers for generations. 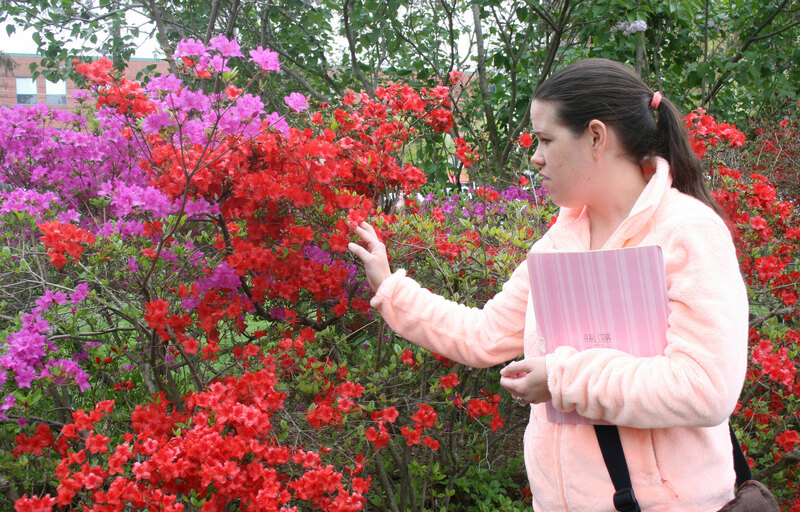 From a Siebold Viburnum, an upright shrub thriving in front of Stockbridge Hall, to an unusual Yellowwood (Cladrastis kentukea) that reveals a heartwood color of yellow and whose blooms resemble white wisteria planted near the Durfee Conservatory, Bayer took her tour across campus to examine 35 specimens. 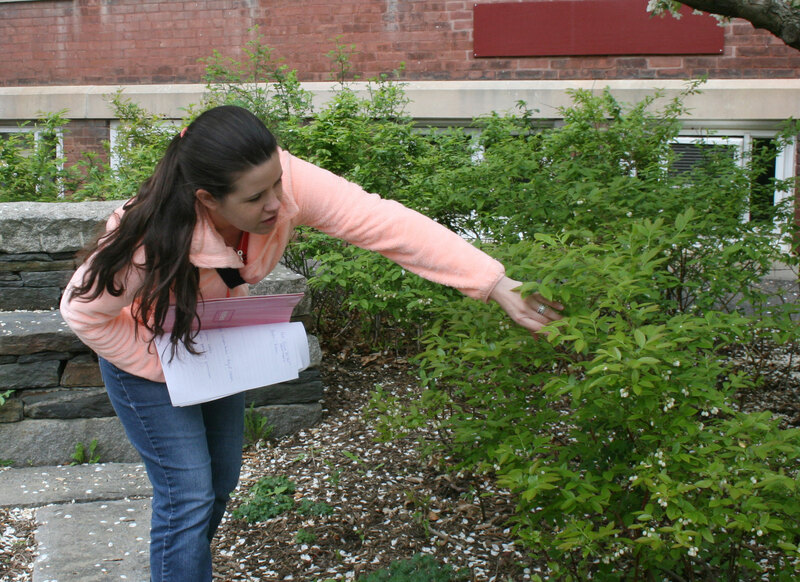 Participants poked their heads into clouds of fragrant Syringa vulgaris, better known as lilac, and to marvel at Carolina silverbells, a tree that appeared to have recently jumped out of a fairy tale. Bayer told those gathered that the plant industry has been heading in a new direction for the past several years, focused on growing cultivars through selective breeding that are much smaller. Urban landscapes and smaller yards cannot handle plants like the large farmyard lilacs of old. 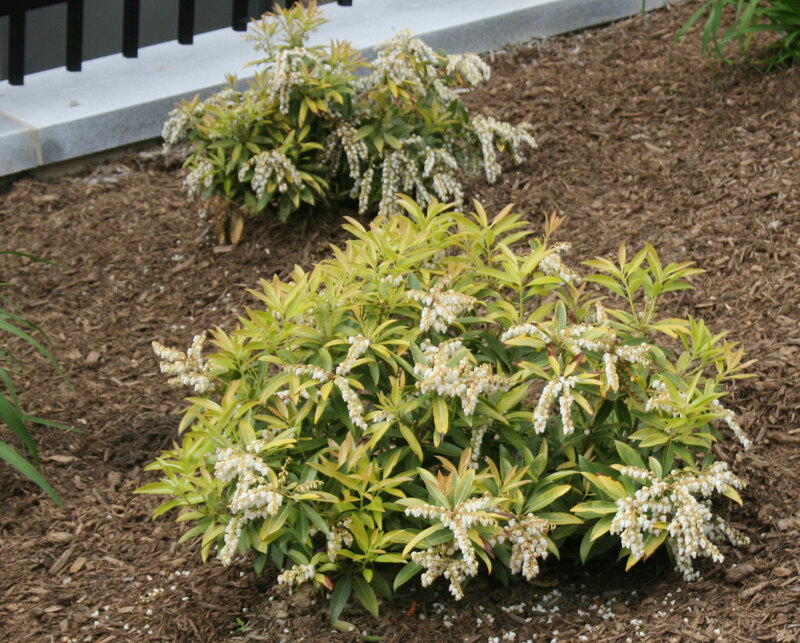 On the tour, she pointed out several such smaller plants including a sweet-smelling dwarf lilac (a dwarf Korean variety). Campus arborist Todd Beals said the entire managed landscape comprises the Frank A. Waugh Arboretum*. 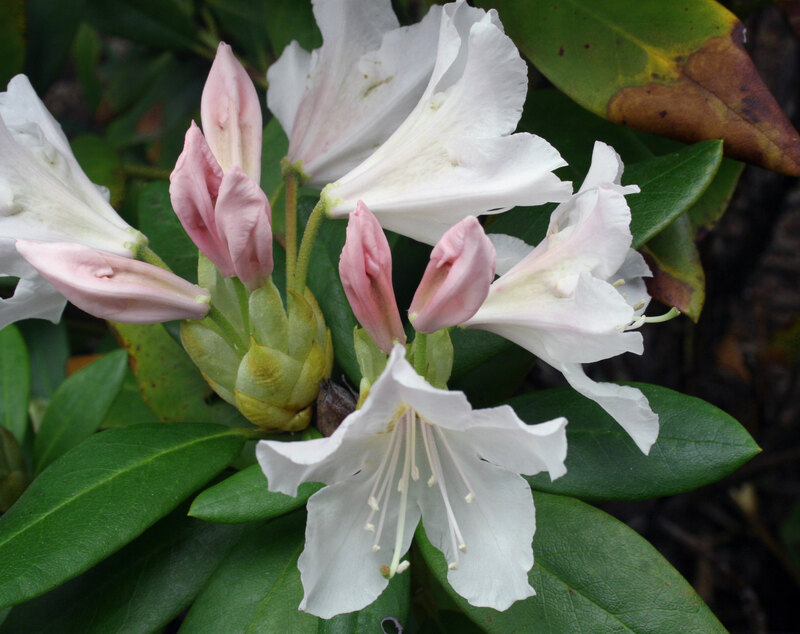 It consists of 9,000 trees made up of 560 species, and that does not even include show-stopping shrubs such as Pieris x ‘Brouwer’s Beauty’ (andromeda) or Rhododendron catawbiense ‘Cunningham White’ (a white rhody). A little known fact is that the campus also boasts about 20 state champion trees. To qualify as a national champion tree of a species it must be the largest of its kind on United States soil and also the oldest. One handsome specimen that made the grade is the Japanese elm planted in front of South College by William S. Clark (third president of Massachusetts Agricultural College, now UMass). In 1890, he planted seeds that were brought back from Sapporo, Japan by William Penn Brooks (the eight President of Massachusetts Agricultural College). 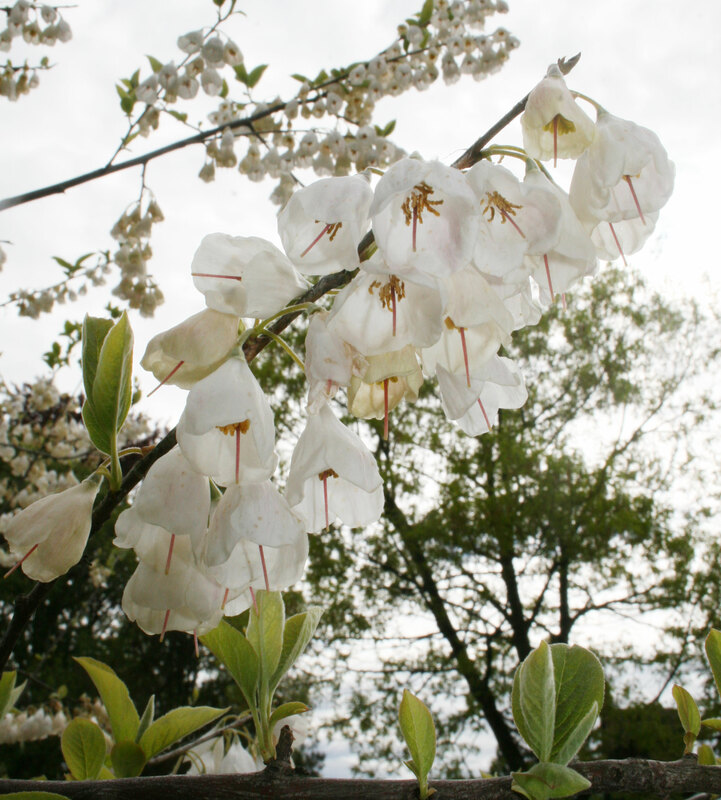 The next ornamental tree and shrub tour is scheduled for September 27. Contact Ellen Weeks to register. To view campus trees online, click here. *Frank A. Waugh was the first head of the Landscape Architecture Department. Under his leadership in the early 20th century, the campus arboretum flourished. In 1944, then President Hugh Potter Baker officially recognized the campus arboretum as a memorial to Waugh and his contribution to the landscape.